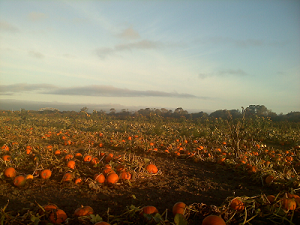 Northwestern California Northwestern California U-Pick farms: Find a pick your own farm near you in Northwestern California for fruit, vegetables, pumpkins, organic foods,local produce and more! Looking for a local, pick-your-own farm in Northwestern California? Scroll down this page and you will see the U-Pick farms in Northwestern California, sorted by county. Those that offer organic or sustainably grown produce are identified by the words "organic" and/or "sustainable" in Green, next to their name (see "What does Organic mean?"). The U-pick crops they offer follow the name of the farm. To search the page for a specific crop, use Ctrl-F (or on an ipad or Mac, use their "search on this page" function) If they have a website, the name will be in blue and underlined; click on it and it will open their website. If you find anything outdated or inaccurate, see the customer and farmer menus (as appropriate) at the top menu bar to submit updates and corrections and help me keep each current! 5851 Myrtle Avenue, Eureka, CA. Phone: 444-8261. Not really a pick your own, but interesting tours. Native plant nursery. School Tours - Students learn local ecology, wetland restoration, and native plant horticulture with hands-on activities. Open houses in May and November have special activities for kids, including wildlife drawing, native plant treasure hunt, nature printing and more. PO Box 137, Honeydew, CA, 95545. Phone: 707-629-3563. Open: They may have closed; Does anyone have current information, are they still offering pick your own or are even open? If so, please write me, their last reported hours were Late June, July and August daily. All the daylight hours. Directions: Located on Mattole Road, just three miles NW of the Honeydew Country Store or eleven miles from the Petrolia General Store, going SE on Mattole Road. Take Hwy 101 cut-off "South Fork - Honeydew" to Honeydew or "Wild cat" from Ferndale to Petrolia off Hwy 101. A visitor writes on July 01, 2014: "They offer pick your own blueberries only. ,Great farm. I want to help them get the word out since they are very old school and do not know how to take advantage of marketing on the internet. They do not have a web site or use e-mail. " 3003 Hwy. 96, Willow Creek, CA. Phone: 530-629-3516. Email: [email protected]. Organically grown produce. Farm tours, classrooms welcome. Open: Farm Store Hours are 7am-7pm, 7 days per week. Located one mile from the Nevada County Fairgrounds. Best days to come are Wednesday & Sunday. 2103 Baird Road, McKinleyville, CA. Phone: 707-839-2017. Email: [email protected]. Open: Call to confirm current hours; In season (typically July 4th to Labor Day), 7 days a week, from 10 am to 5 pm. Pick your own California organic blueberries. 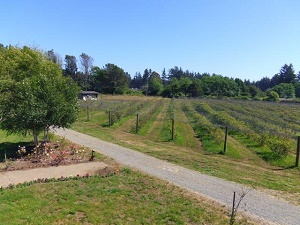 A small, family-owned organic Blueberry farm located in Humboldt County, very near the Pacific Ocean in Dows Prairie (north of Arcata almost to Trinidad on Highway 101). Note from a visitor (April 2006): "I found Wolfsen Farms on your excellent website last year, and I highly recommend them. Just wanted to let you know this is GREAT place for organic blueberries! Acres and acres of well-tended, netted berries, easy to pick on a beautiful farm right on the coast. Owners provide the buckets and direct you to the section with the ripest berries. A wonderful way to spend a sunny day. " 21923 Dersch Road, Anderson, CA 96007. Phone: 530-365-2332. Fax: 530-365-6313. Email: [email protected]. Directions: Take I - 5 to Anderson, take the Deschutes Road exit. Head northeast on Deschutes road 4.5 miles farm is on right at the intersection of Dersch and Deschutes road in Anderson. Click here for a map and directions. Crops are usually available in October. Open: September 29 - October 31st Saturday and Sundays 10am to 11pm, Monday to Thursday, 9am to 7pm, Friday 9 am to 11pm Payment: Cash, Check, Visa/MasterCard, Discover, AmEx. Comments from a visitor on June 19, 2013: "We visited Serendipity Ranch in early June to pick cherries. The owners were helpful and friendly. They allowed us to have a picnic in the shade of the orchard. We will be back to pick plums, peaches, and apples later in the season. Don't miss this ranch! Great family fun! " Comments from a visitor on August 12, 2012: "We visited Serendipity Farm today and bought a bunch of peaches and plums to make jam. The owner is so nice, she made us feel very comfortable. We really enjoyed visiting the farm and will definitely go back! " Comments from a visitor on July 20, 2012: "My mother told me about the ranch then I went out with my children then I told my neighbor who in turn told her friends by the time cherry season was over we had a croud of 15 or more people meeting out there weekly. They were so busy but the lady in charge whose name is also Tammy was able to walk and talk with us and even entertained the children by letting them pick cherries from what she called the childrens tree which in fact was a tree up by her stand that had limbs covered in cherries about a foot off the ground. So I highly recommend her business. I believe they start with Cherries in June then go to Blueberries, Boysenberries, Several different varieties of Plums,White Peaches, Figs, Apples,garden produce, Nectarines, cut flowers and ,more peaches throughout the summer"
15109 Old Hwy 99, Grenada, CA 96038. Phone: 530-436-9974. Fax: 530-436-9974. Email: [email protected]. Open: Their website is gone; Does anyone have current information, are they still offering pick your own or are even open? If so, please write me, their last reported hours were June 14 through October 31 from 10am through 6pm, seven days a week. Produce Stand and Country Store, Picnic and Play Ground area. Petting Zoo and Pony Rides week ends only, Sundays Horse Drawn carriage Rides by appointments only. June 14 to September 14. Directions: Grenada in northern California from Redding, going north on I-5 to Grenada/Gazelle exit No#766, then go west to Old Hwy 99 then south on Old Hwy 99 about 7 miles look for the Farm signs on the Hwy, The farm will be on the west side of the Hwy. This is also the same route when traveling south bound from Oregon. Pumpkin Patch, Petting Zoo, Pony Rides, Horse Drawn wagons, games and prizes, Country story, Gift Shop, Back Goods, Jams & Jellies and much more. Our fall crop and pumpkins patch starts September 20th.